Learn how to easily open your images in Photoshop, how to have multiple photos open at once, the difference between opening JPEG vs raw files, and more, in the latest version of Photoshop CC! So far in this section on getting our images into Photoshop, we've learned how to set Photoshop as our default image editor for both Windows and Mac so we can easily open images into Photoshop directly from our operating system. 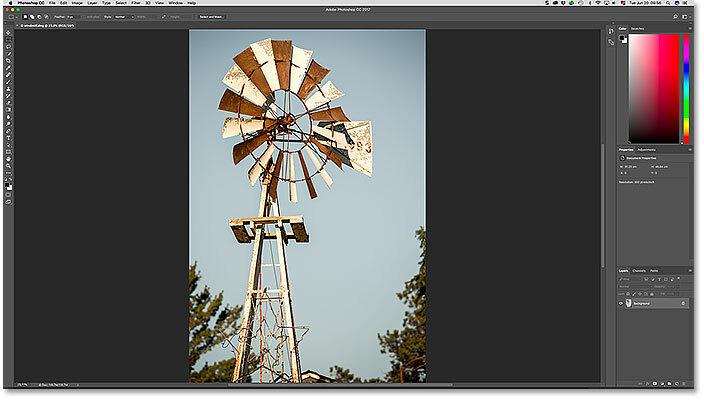 In this tutorial, we'll learn how to open images from within Photoshop itself. Opening images may sound like a no-brainer. But when you're dealing with a program as massive as Photoshop, even a simple task, like how to open an image, can be less obvious than you'd expect. 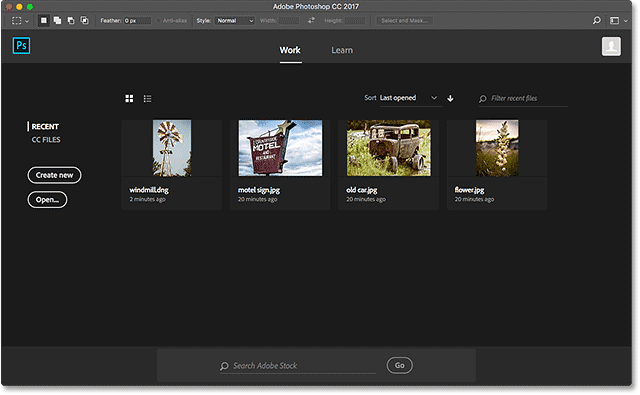 And, in the most recent Photoshop CC updates, Adobe has added a new Start workspace that gives us new ways to open our images. So even if you've been using Photoshop for years, there's something new to learn. There are actually two different ways to start working in Photoshop. One is to open an existing image. The other is to create a new, empty Photoshop document. In most cases, especially if you're a photographer, you'll want to start by opening an image, and that's what we'll be learning how to do here. We'll also look at the important difference between opening a standard JPEG file and opening a photo that was captured in the raw file format. We'll save creating a new, empty Photoshop document for a separate tutorial. To get the most from this tutorial, you'll want to be using Photoshop CC, and you'll want to make sure that your copy of Photoshop CC is up to date. This is lesson 4 of 10 in Chapter 2 - Opening Images into Photoshop. Let's get started! 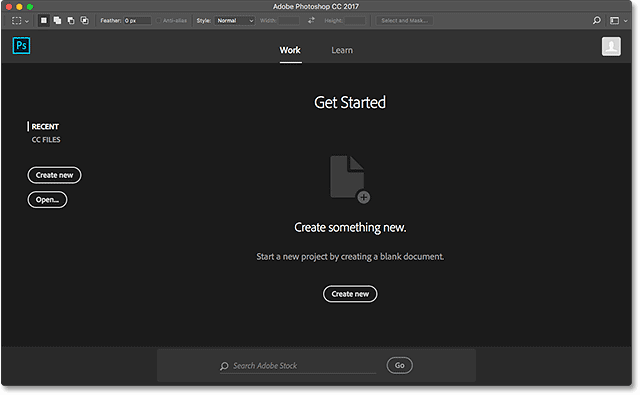 The Start screen in Photoshop CC showing thumbnails of recently-opened files. The Start screen without any Recent Files thumbnails. Clicking the Open button on the Start screen. Selecting an image by double-clicking on it. The first image opens in Photoshop. © Steve Patterson. Clicking the thumbnail in the Recent Files area of the Start screen. Going to File > Open. The new image opens. © Steve Patterson. The third image opens. © Steve Patterson. I now have three images open. 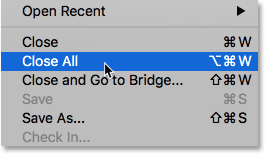 Photoshop places each new image in its own separate tabbed document. They're called tabbed documents because each document has its own tab along the top. Each tab shows the name of the image along with other information. To switch between your open images, simply click the tab of the image you want to view. Switching between open images by clicking the tabs. The first image is visible once again. Click the "x" to close a single image without closing any others. Going to File > Close All. All three images, ready to be re-opened. So far, all of the images I've opened in Photoshop have been JPEG files. We know they were JPEG files because each one had a ".jpg" file extension at the end of its name. But what about raw files? That is, images that were captured using your camera's raw file format? Opening a raw file instead of a standard JPEG. Each camera manufacturer has its own version of the raw format, each with its own unique extension. Canon raw files, for example, typically have a ".cr2" extension. Nikon uses ".nef", while Fuji uses ".raf". 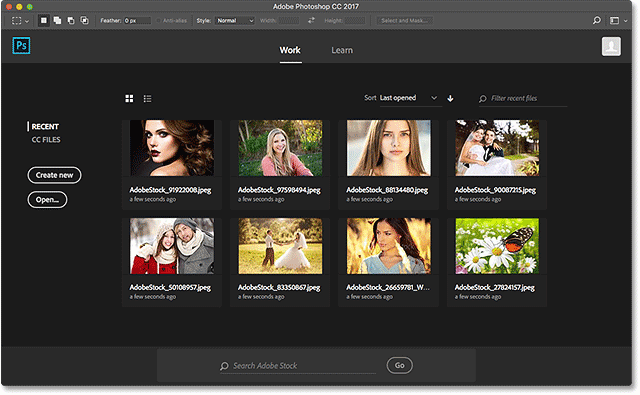 And as we've seen, Adobe also has its own raw format with a ".dng" extension. Raw files are beyond the scope of this tutorial, but you can learn more about them in our Raw vs JPEG For Photo Editing tutorial. When we open JPEG files, they open directly into Photoshop as we would expect. But when we open a raw file, something different happens. 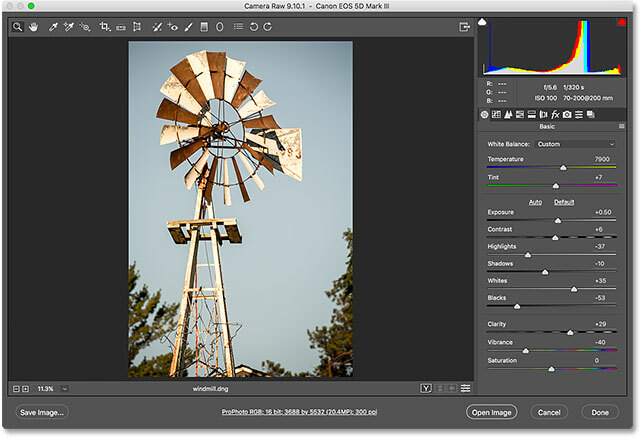 Rather than going straight to Photoshop, raw files first open in Adobe Camera Raw. Camera Raw is a separate plug-in included with Photoshop that launches automatically whenever we open a raw file. 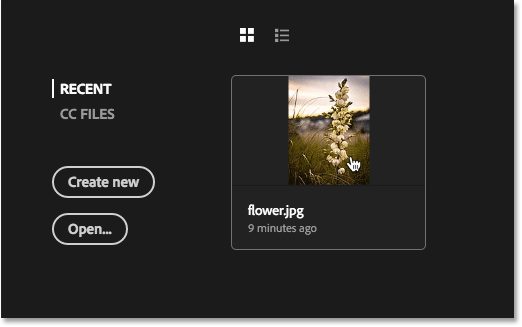 Photos captured as raw files open in Camera Raw. Clicking the Open Image button. 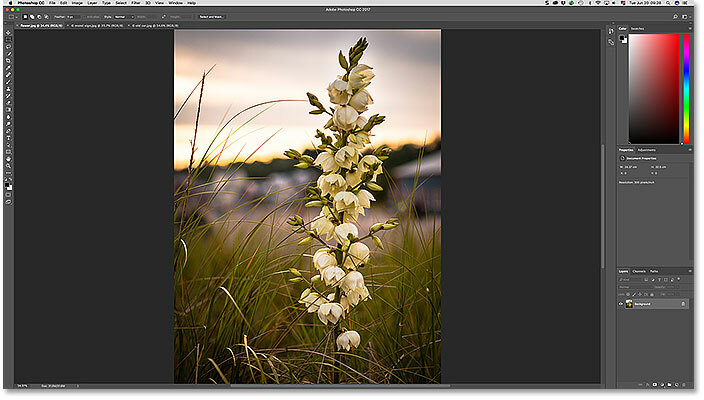 The image moves from Camera Raw into Photoshop. Going once again to File > Close. Back to the Start screen. One last feature we should look at in the new Start screen is the ability to see our recently-opened files either as thumbnails or as a list. Switching from Thumbnail View to List View. Switching back to Thumbnail View. And there we have it! 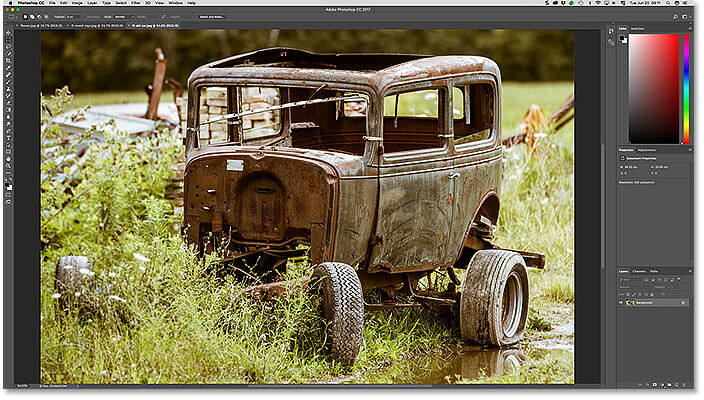 Photoshop's Start screen makes it easy to re-open images we've already worked on. But it's not so great for opening new images. 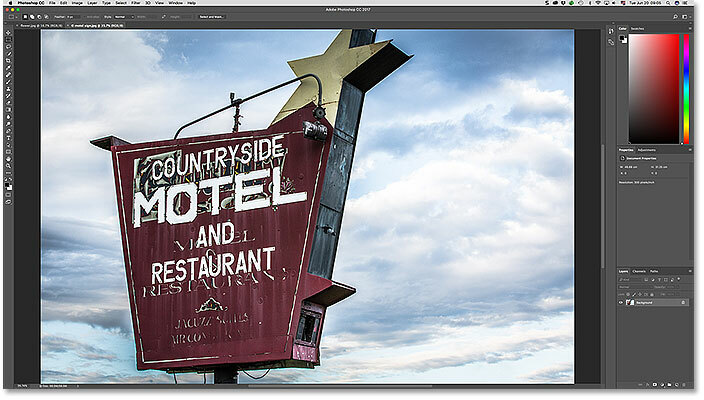 In the next lesson in this chapter, we learn why Adobe Bridge, the free file browser included with Photoshop, makes finding and opening images into Photoshop much easier!